The US and Russia have agreed to meet in The Hague next week to discuss plans to convene a summit on Syria, a State Department spokesperson in Washington said Monday. The US delegation to the meeting includes Washington’s ambassador to Syria Robert Ford and a State Department diplomat – likely US Undersecretary of State for Political Affairs Wendy Sherman – while the Russian entourage is likely to include deputy foreign ministers Gennady Gatilov and Mikhail Bogdanov. “We have long agreed with Russia that a conference in Geneva is the best vehicle for moving towards a political solution,” State Department spokeswoman Jen Psaki told a daily briefing for reporters on Monday. In previous weeks, US and Russian officials have argued whether Iran should participate in the Syria Summit. Moscow insists that Iran has a positive role to play in helping to bring an end to the three-year conflict in Syria. In May, both sides agreed that the Geneva 2 talks, based on the results of a similar Syria peace summit held in Geneva in June 2012, would be held some time in July. However, this was postponed indefinitely amid growing diplomatic tensions between Moscow and Washington. During the G8 meeting in Northern Ireland in June, US President Barack Obama and Russian President Vladimir Putin clearly showed their disagreements over Syria. Gatilov believes that Geneva 2 will not be held before October 2013. Lakhdar Brahimi, the UN/Arab League envoy to Syria, is likely to attend the Russia-US meeting in The Hague. The flurry of diplomatic activity comes as an UN team of chemical weapons experts arrived in the capital Damascus on Sunday after months of delays to investigate conflicting reports about the possible use of chemical weapons in the Syrian civil war by either or both sides. Russian Foreign Ministry spokesman Alexander Lukashevich said Friday that Moscow welcomes the principal agreements reached to start the work of the group of international inspectors in Syria. “Although late, [their arrival] opens the way for a thorough and unbiased investigation of the situation around the alleged use of chemical weapons in Syria,” Lukashevich told reporters. The US has previously said it had proof that the government of Syrian President Bashar Al Assad used these banned weapons against the rebels. But Russia says it has information which indicates that it was the rebels, and not the government, who resorted to chemical weapons – such as sarin – in the northern city of Aleppo. The 20-member UN team, which also includes experts from the Organisation for the Prohibition of Chemical Weapons, will visit Khan Al Assal near Aleppo and two other locations which Russian media has said are being kept secret for security reasons. 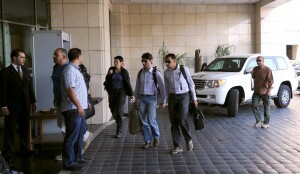 The Russian Foreign Ministry said that in accordance with the “attained understandings” during negotiations paving the way for the experts’ arrival in Damascus, they will work in the country for 14 days. The period could be extended if required and if all parties agree.